I’m so pleased with this little quilt. 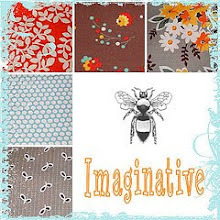 This stack of fabric was one I pulled for my Friday fabric stack #2 — I started with the wonderful Liberty of London Tom’s Jet print and paired it with some blue and gray solids and prints and one little spot of bright orangey-red. I was inspired by this mini quilt from the Purl Bee. I like how the geese are flying in all directions, and I love how they’ve played with the different prints for the triangles and backgrounds. I used this method for making 4 flying geese at a time. Fun! (and quick and painless!). Very quickly I had a pile of geese which I then arranged on the design wall. 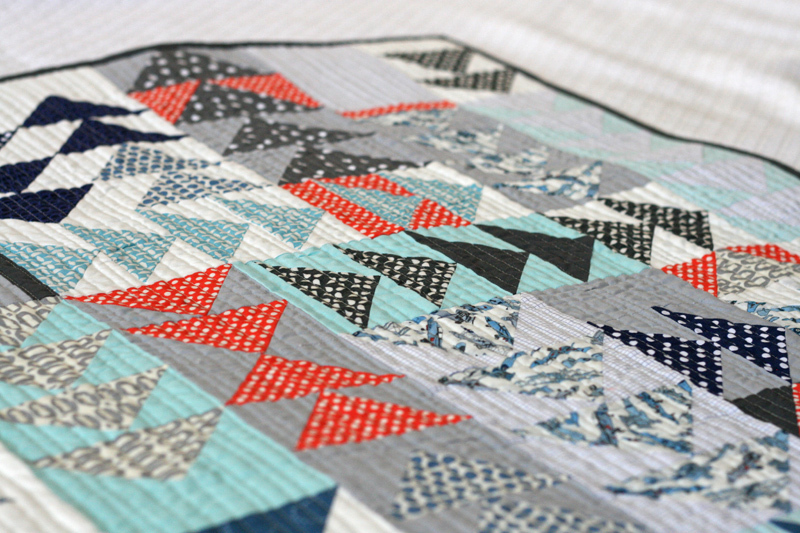 Since I used two sizes of geese, I had to add in a few additional scraps of fabrics to make everything fit, and I think those little pieces are one of my favorite aspects of the quilt. I thought at first I’d add to it to make it a bit larger, but after spending a lot of time thinking of options, I finally decided to keep it as it was and turn it into a wall hanging for Max’s room. Once again I quilted it with narrow straightish lines. I love the texture it gives the quilt, and I love this type of look, especially for a wall hanging. I wish I could show you a photo of it on his wall, but even though I did manage to make a hanging sleeve, and buy a dowel, I still haven’t managed to get it up on the wall! 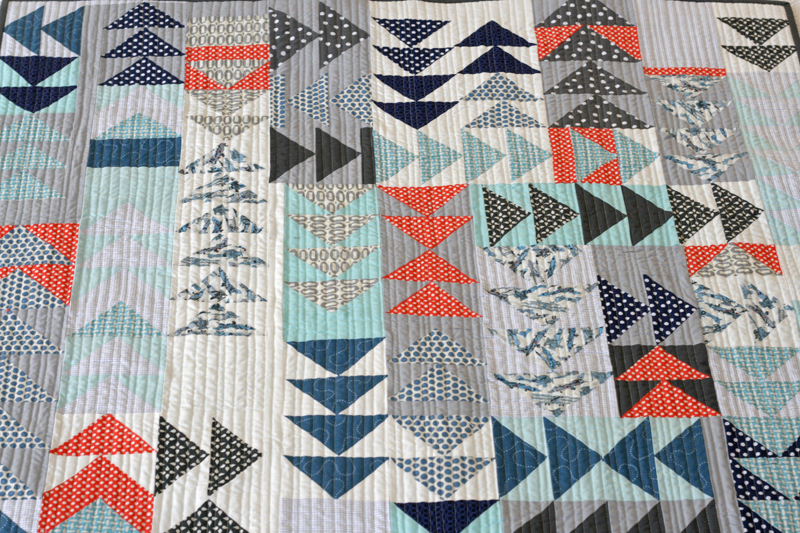 This entry was posted in baby, Fabric, Posts about Quilts, Quilts and tagged boy quilt, flying geese, handmade, liberty of london, modern, quilt, quilting, straight line quilting, toms jet, wall hanging. Bookmark the permalink. I LOVE this quilt! I am obsessed with flying geese. Definitely going to have to make my own version of this. Thanks for sharing the pictures. Wow, this is gorgeous! Love the colors, and the geese flying every direction are perfect! What a fantastic color scheme!! I love the way this looks! Fantastic. I’m making my first flying geese, for a new quilt. If all goes well, I may try something like this. Great job. I LOVE this quilt!! 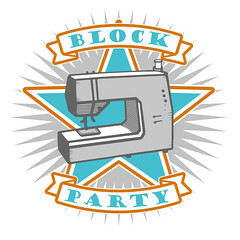 This is going on my “to quilt” list!!! This is a GREAT quilt!! I absolutely love this quilt. And I’m so pleased you quilted and finished it! What a terrific quilt!!!! I really like it! 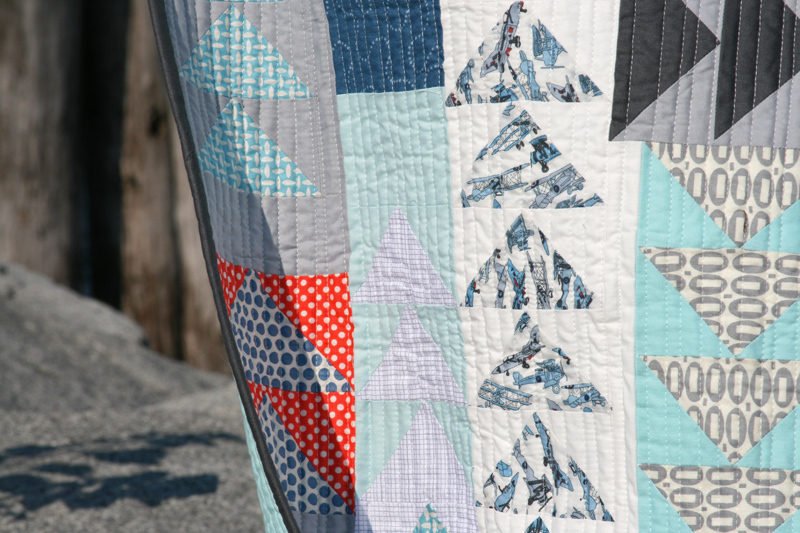 Love the colours, the quilting and the varying direction of the geese! I love it! The colors and different sizes really make for an interesting piece. The first thing that came out of my mouth – that’s pretty. As always, thanks for sharing. I need this inspiration. 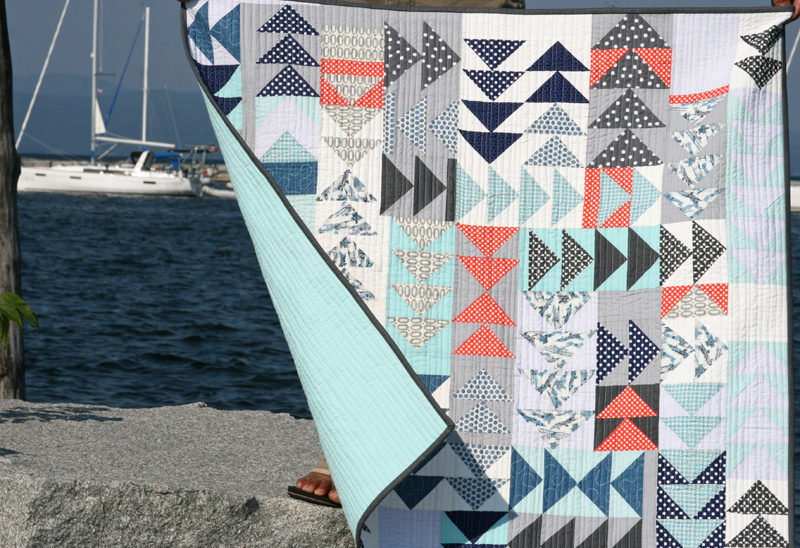 Oh I was so inspired by the Purl Soho quilt when I visited there this summer and have been wanting to make a similar one ever since! I love your spin on it. And so glad you posted the link for the flying geese! Now maybe I will get to mine. Can I please ask what fabrics did you use? I love the flying geese and the design. I want to make one in the Sam colours. Great!! I like this quilt a lot. I like the colours, I like the triangles. I’m inspired to make a wallhanging for my little one’s room, too, and making something like this one, too. I am crazy for this color combination! Such a great look. This quilt is awesome! What a lovely quilt. The texture is awesome. I’m glad you kept this one for Max! Hi! I love this quilt and the tutorial is great, just had to rejig it a bit because the instructions on sizes aren’t crystal clear. I’d like to ask you what the two sizes of geese are in his quilt? The colors are gorgeous! Love how the orange/coral makes the blues sing…. stunning in its simplicity! I love this quilt! What are the 2 different sizes of flying geese you used? What was the finished size of the wall hanging? 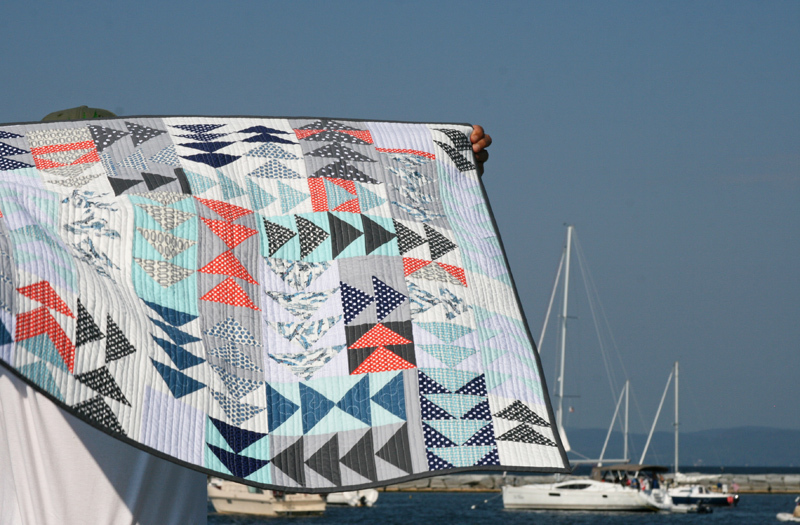 I love this quilt and I was wondering what the different sizes of the triangles are and how big the quilt is overall.